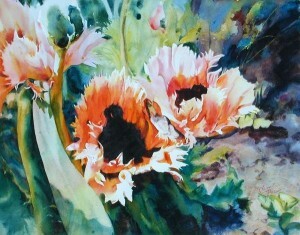 Celebrate spring with “Blooming” – beautiful floral watercolors by Elaine Frenett. Elaine captures light and warmth in her sophisticated watermedia paintings. She is a teacher as well as an artist, leading popular art journaling clinics every month at the Art Center. Come meet Elaine and see her show and her studio on the top floor of the Art Center. Live music will be performed by the local, “vivacious peasant folk” band Patchy Sanders. This month’s special First Friday show in the Classroom is called “Hearts and Hopes Illuminated”, a group show featuring submissions from survivors of sexual assault within our community, SOU students, and SASH (Sexual Assault Survivors’ Healing) Support Group. This is the start of a month of local events for Sexual Assault Awareness Month, a worldwide pro-active annual occasion.